The Alternative Dispute Resolution section of the State Bar of Texas honored ACU’s Dr. Joey Cope, executive director of Duncum Center Solutions, with its highest award. Cope mediates disputes and trains people, churches and organizations in conflict management at the Duncum Center, which he helped found in 2000. He joined the State Bar of Texas ADR Section that same year and later served on its Council in several roles, including chair. In January, the council presented him the Justice Frank G. Evans Award, which honors individuals who have made exceptional and outstanding efforts in furthering the use or research of alternative dispute resolution in Texas. Cope came to Abilene as a litigation lawyer in 1986 and several years later was invited to work in development operations at ACU. 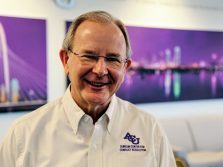 Although it was an odd career path for someone who had been practicing law, Cope decided to give it a try, and 27 years later he’s still working for ACU. Cope served as Dr. Royce Money’s executive assistant for seven years before becoming director of the ACU Foundation in 1998 and starting the Duncum Center for Conflict Resolution in 2000. The Duncum Center offers mediation and conflict intervention services as well as training in negotiation and conflict management skills. The center began with a focus on helping churches and organizations, but later Cope helped expand the center to offer a Master of Arts in conflict resolution and reconviliation and a Conflict Resolution Certificate. The center moved to ACU’s Dallas campus last month. As part of the State Bar of Texas Alternative Dispute Resolution Council, Cope attended several meetings each year and helped monitor legislation in Austin. He served as chair of the section in 2011-12 and now remains on the council ex officio. Cope is a credentialed mediator of the Texas Mediation Credentialing Association and serves on its board of directors. He is the co-author of West Publishing’s Texas Practice Guide: Alternative Dispute Resolution.